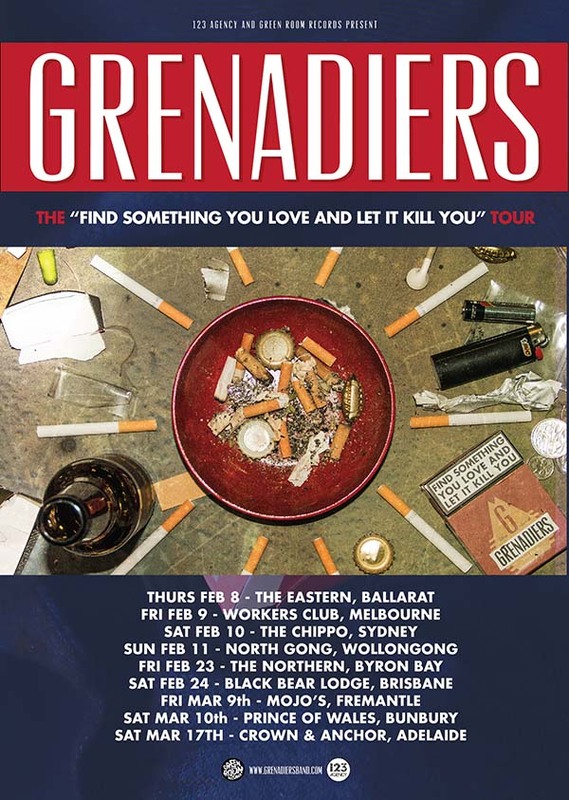 Adelaide mainstays Grenadiers are stoked to release their third LP Find Something You Love and Let It Kill You today. So stoked, in fact, that they've unveiled a chunk of headline dates to spruik it to the masses. The LP release backs up singles Long Way Down and Suburban Life, which both proudly tote the trio's hard yakka, cheeky, utterly irresistible brand of riffy Australian rock. It truly is a ten track pack of heroic, rugged rock. Just last night the band brought their A-game to a live performance at the South Australian Music Awards, where they were nominated for the Punk Award. The next step is a lengthy headline national album launch tour. Having taken to stages with Bad//Dreems, Millencolin, '68, they're primed to take on the mighty Guitar Wolf next month. Grenadiers are a live force to be reckoned with. Expect spot-on guitar tones, frontman Jesse Coulter's characteristic whiskey'n'smokes growl and an escalating maelstrom of fist-pumping, sing-along punky rock. In the meantime, best take Grenadiers' advice. Find Something You Love and Let It Kill You immediately the band's website, stores and streaming services. Tickets for their tour from the band's website.